If you ever run into Big Sleeps on the mean streets of Los Angeles -- in a gallery, tattooing, or working a wall -- you might be somewhat intimidated. His stature, his grooming habits, his shaved scalp, and the oversized tattoo on the back of his head, a self-portrait with beaming eyes symbolizing he is always watching his back, can be a bit daunting. However, he is one of the most gregarious, friendly, humble and approachable artists I have ever met. He specializes in regional cholo lettering, a Los Angeles nativist tradition with its roots in gang culture dating back to the 1940s. His interest in the style began in the Pico-Union district where he was raised, an area heavily infested with gang activity and mostly known via Psycho Realm's influence and hometown. For those of us who grew up with an artistic inclination but were from low-income, high-density, crime-plagued, poverty-stricken neighborhoods, our influences were mostly street-based, as a result of denied access to arts districts or programs. For Big Sleeps, a local wall he traversed daily on his way to elementary school draped at the height of gang fashion lettering proved to be his major influence. A handful of times from a nearby body shop, he would recover left over spray paint and clandestinely trace the gang letters until he was skillful enough to develop his own style. In a way, he already had a creative agenda; to be the best writer in the hood, and if he did it with love and respect, it would one day materialize to something bigger. 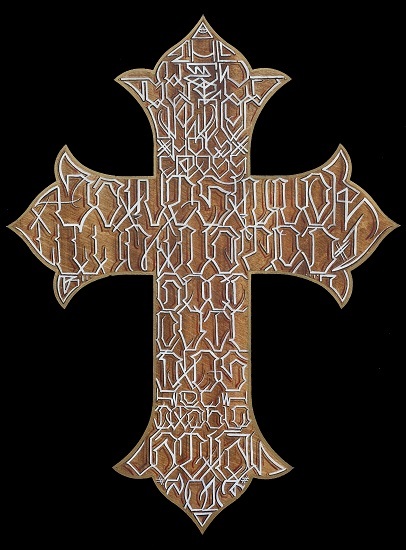 That day came in the mid 90s when local and upcoming street lyricists, Psycho Realm, asked him to provide some lettering, logos and images, followed by a request for something similar from Teena Marie, the soul singer known for songs like Déjà Vu and Fire and Desire with Rick James, and others like Dissizit and OG Abel. A few years later he got involved in tattooing at Modern Ink in Westchester and a few others, but he had visions of grandeur and dreamt of something bigger, rather than being stuck within the confines of the tattoo parlor cubicle. At the encouragement of his wife, he put together a lettering scrapbook from notebooks, envelopes, and handwritten letters, that came with instructions and was basically a font manual focused on regional lettering to be used at tattoo parlors across California, Letters to Live By. They put together an idea and shopped it around at the Ink-N-Iron Tattoo Convention, and it was immediately picked up by Wendy Belzel of Belzel Books, which proved more successful than what he imagined as it took off internationally. As Big Sleeps and I were discussing this topic at a Beverly Center restaurant, a young man interrupted us kindly and lifted up his shirt to show us a tattoo Big Sleeps did on his stomach a few years ago, it was a classic moment and rightly deserved. At any rate, the book began to take off and soon he was invited to other conventions around the United States, and out of the clearest blue sky he was invited to a tattoo convention in London by a good friend and internationally renowned tattoo artist, Walter 'Boog' Brown. Mind you, he had never traveled outside of the U.S. and was a bit hesitant, mostly out of a fear of the unknown, like the idea that it was too good to be true. He was currently enrolled in a community college art class and was in the middle of an exam, but he took a risk and boarded a plane, even losing the address to his destination en route, but once he arrived he had a long list of European clients all eager to get cholo lettering tattoos, t-shirts and books by this phenomenal dark progressive artist. Shortly thereafter, he was invited to tattoo conventions and to paint walls in places like Hawaii, Brazil, Sweden, Denmark, Germany, France, Korea and Japan. 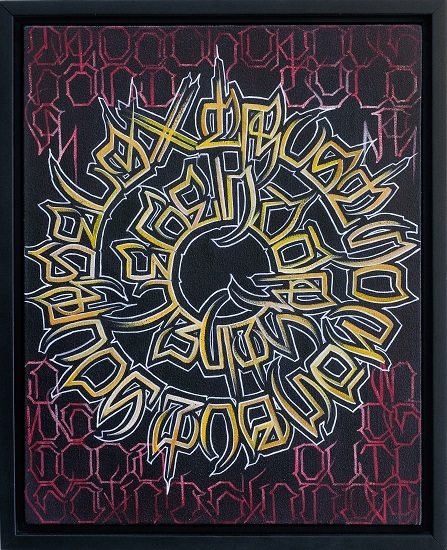 He created a second volume of lettering designs, he worked on another lettering book with fellow Angeleno colleague, Defer from K2S, and last year he was invited to the Alphabet Soup Art Show to exhibit with other current lettering giants from Los Angeles: Chaz Bojorquez, Retna, Prime, Defer and Cryptik. Furthermore, he collaborated with longtime friend since elementary school, Joe 'Prime' Reza, on another lettering book, Neighborhood Offerings, which was inducted into the Getty Research Institute by chief curator Marcia Reed. After the passing of his mother from a struggle with cancer, an increased motivation arose in Big Sleeps to live his life with purpose, discipline and respect, something he neglected while she was alive. Many of us have tortured our parents in the lifestyles we've chosen, but once you're on the right path evoking a high sense of creativity based on arduous experiences, like death, betrayal, and isolation, you can flourish and reach places you never thought were possible. Nowadays, Big Sleeps balances metaphysics and purpose to create masterpieces that focus on simplicity because the mastery of his technique has become innate. When he overthinks his work, it becomes too complicated and cumbersome, thus, the way of the master is through ease and focus. And like a true master of any skill, your daily purpose is to be better than you were the previous day. Photos courtesy of Monica Torres 2013.